Recent McCormack graduate Marija Bingulac (PhD, Public Policy) conducted research focused on measuring labor-market discrimination and hiring practices that create major barriers to gainful employment for the Romani. “The policy suite that Serbia pursued over the past ten years failed to produce a desired level of educational inclusion or a rise in the economic situation of the Roma citizens. Roma deprivation persists, in large part, because labor-market participation barriers have not been sufficiently investigated or addressed,” Bingulac explains. She was the first researcher to embark on quantifying a wage penalty for being a Roma person in Serbia. Before her research, the conventional wisdom was that Roma people chose to be poor and that discrimination does not exist. However, her research revealed and quantified a penalty in the labor market solely based on Roma race/ethnicity. She also found that, in addition to discrimination, health served as a major barrier to economic well-being, with low-income Roma experiencing multiple health issues at younger ages that rendered them incapable of working. Bingulac’s research is key to inform proactive policy for advancing the well-being of the Romani people by bringing Roma voices back into the policy discussion at a crucial time in Serbia’s development. 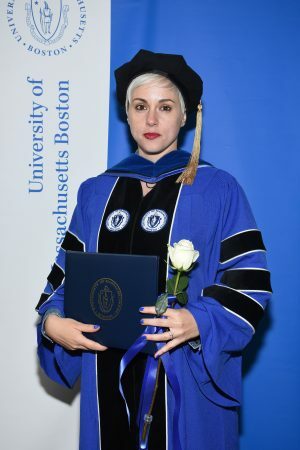 Chosen among 15 student peers, Marija Bingulac was awarded the Public Policy Dissertation Book Award at Commencement this year. Co-chairs Friedman and Erin O’Brien deemed her research as path-breaking and comprehensive, carried out with diligence, intelligence, and courage. Bingulac was recently hired as the senior project manager of the On Solid Ground Coalition and a research associate at the Center for Social Policy where she works on participatory action research and projects related to poverty alleviation, cliff effects, and housing stability.